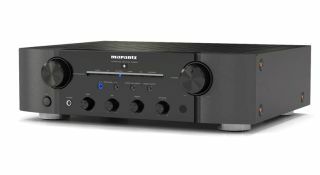 Marantz reveals new PM8006 stereo amplifier | What Hi-Fi? With a list of technical highlights that makes it sound like a bank-vault, Marantz's PM8006 is due to go on sale in the UK in December of this year. There's no word yet on the power or connectivity of this new stereo amp, but what we do know makes it sound like it will be, at the very least, quite heavy. Its toroidal power transformer is double-shielded. It features solid aluminium heat-sinks, triple bottom-plate and vibration-supressing feet. Even its solid copper speaker terminals are nickel-plated. In addition, your £1000 buys a newly designed moving-magnet phono stage equaliser stage and electric volume control for better separation and gain symmetry.